Keeping your feet baby soft is probably the dream of every woman. Even if you regularly make salon treatments, once in a couple of days you still need to arrange the foot spa to keep this healthy and beautiful effect. Unfortunately, as we age, this should take more and more attention, as the skin receives fewer vitamins and requires moisturizing and nutrition. It is completely unpleasant when the feet resemble a sandpaper. How now can you keep the beauty? By living in the spa? No, it’s not necessary to spend money for expensive salons, you can arrange relaxation right at home, at a convenient time for you. 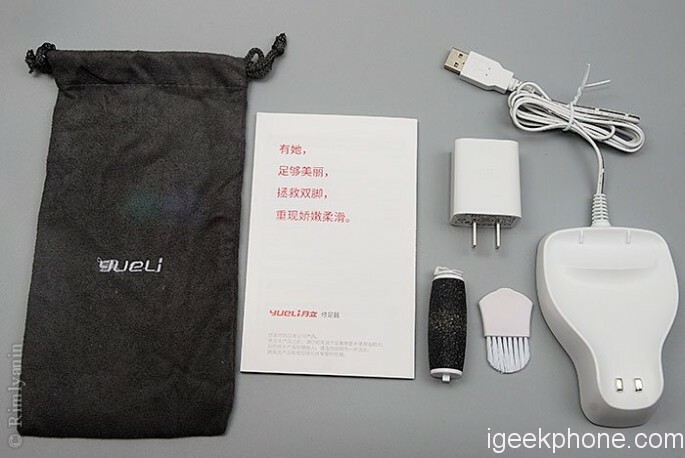 This time Xiaomi introduced Xiaomi Yueli Electric Foot Machine an electric pumice roller. It will become the ideal analog of manual pumice. You don’t need to rigorously rub your heels until it hurts. Xiaomi Yueli Electric Foot Machine is made with an ergonomic handle covered with a layer of rubber that is comfortable to hold in your hand. Also, this rubber coating gives protection from water. A pair of AA Ikea Ladda for size estimation. On the front side there is a logo on the front, and in the middle, there are buttons for switching on and switching the speed of rotation of the roller. Slightly below the buttons under the rubber layer, a green LED is displayed, showing the activation, processor termination of the charging process. And it seems to me that in the process of exploitation, when the contacts will get more and more tightened with fingers, and they just fall under your fingers, the situation will even deteriorate somewhat. Xiaomi Yueli Electric Foot Machine has a convenient and practical design (the size is 173 × 76 × 32.5mm), so you can easily take it with you in a travel. By the way, about the process of charging, it lasts a little longer than promised from the manufacture of 3 hours and consumes slightly more than the claimed 1000 mAh. But the charging process itself is unstable, most likely because of the non-tight contact of the roller file on the charging base. At Xiaomi Yueli Electric Foot Machine after they pulled the lever of the latch on themselves, it is necessary to pull out the roller with their hands, there is no buoyancy spring. And when reinstalling it is necessary to get into the square socket and then carefully install the second edge. Pulling a small outward-facing lever on itself, after releasing the latch, the spring slightly pushes the roller, and the reverse is simple enough you simply insert the roller back and lightly press it until it clicks. And also Kemei KM-2503 has a light-emitting diode for illumination of a processed site. 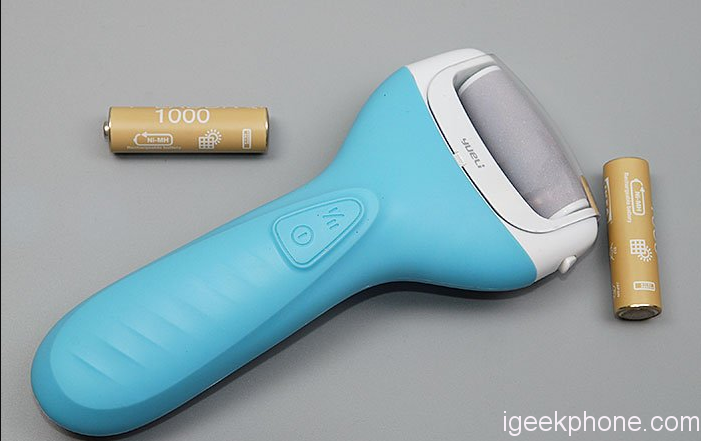 The main selling point of this device is a 360-degree rotating abrasive roller. The device is equipped with a special degree of protection IPX7, so it can easily be cleaned with water, and also you can use the brush (is in the kit) for cleaning. The most important rule that you need to remember is that the care of your feet should be regular, and with this device, it will not be very difficult for you. And in the summertime, it will become a reliable assistant to keep beautiful and well-groomed legs. 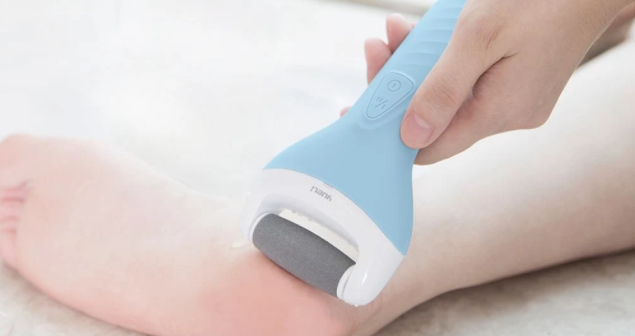 Xiaomi Yueli Electric Foot Machine is now avaialble on TOMTOP just at $37.89 using Coupon Code: SITE5OFF, (Use the Coupon code And get 220 Points To Enjoy Price).